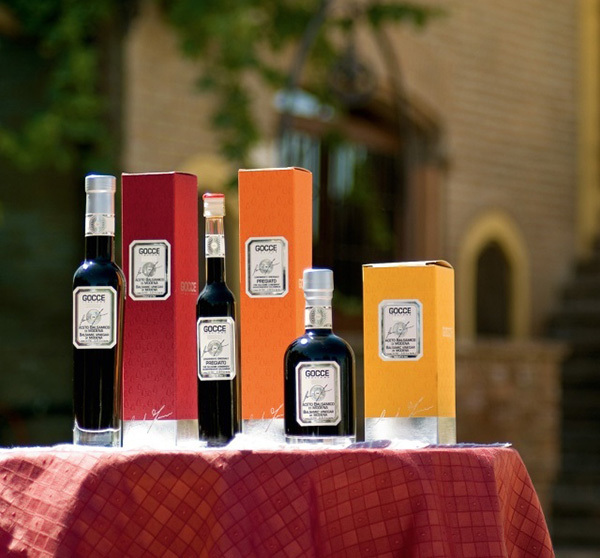 Gocce Italiane brings on tables a Balsamic Vinegar of incomparable quality and taste. The use of colours to distinguish the various qualities of Balsamic Vinegars is inspired by the positive effects of colour therapy. Some are relaxing, others are motivating, exciting or joyful. We play with colours for our packaging thus maintaining a minimal and sober style, which reflects the natural elegance of this Traditional Modenese speciality. Our aim is to offer a new experience of Balsamic Vinegar, not only as simple condiment but as a source of wellness for the body and mind. Our vinegars are made from our own grape musts, they have no preservatives added and no colouring agents (caramel). The grapes used are from the typical varieties of Trebbiano and Lambrusco and the Traditional products are aged in barrels of oak, ash, acacia, chestnut, cherry, mulberry and juniper wood. The ageing takes place in our attics, among the Modena Country where the natural elements create the best conditions for this old traditional practice. The family methods handed down, the experience in selecting the best grapes and the best barrels, knowing the right timing for the various operations, (harvest, pouring, transfers, bottling...) come from the best ingredient and its primary quality: Human being and patience. These are the main features of Traditional Balsamic Vinegar of Modena. Our commitment is our mission: to offer part of our history everyday, thanks to a product which seems always the same although it continues to give unique sensations and pleasure.